The marketing and design team hit a home run with this one. Gigabyte’s new Force M9 Ice Wireless Mouse has a no-nonsense type aura to it. The name alone makes any avid tech enthusiast’s mouth water. It get’s better from there. The device looks amazing, having the word “Force” tattoo’d right on top. Four red LEDs on the left side of the mouse indicate the DPI setting (mouse sensitivity). The USB wireless nano adapter fits underneath and inside the mouse for travel. On the bottom is a compartment for two AA batteries (Duracell included), even though the mouse is capable of running on just one. The bottom also includes a hard switch to shut the mouse off for travel and battery savings, and a button to sync the mouse with the wireless transmitter. From there we dive into actual functionality. Unlike a couple other wireless mice I’ve tested and used recently, the DPI button on this mouse features a two way sliding button. Slide the button up, and DPI sensitivity increases. Sliding down will obviously decrease sensitivity. Once you do either command the red LED’s on the side light up, which indicates the mode you’re in. The ergonomics and looks of this mouse is stunning, though a tad narrow at the inner most curve (I’m 6 feet with larger hands). Even with my preference in larger mice, I still enjoy the way this feels. The buttons are in a great place and the tracking works incredibly well. Now for the geeky stuff. The mouse is dubbed the M9 ICE because according to Gigabyte, the mouse literally works on ice. The super sensitive laser can detect microscopic imperfections on virtually any surface. Now I’ve seen this claim before with a couple different brands. There has always been a caveat with this however. Sure it can work on glass, but how consistent and smooth will it actually track as I move the mouse around? Will it jump or miss what I’m trying to do? Not with the M9 Ice. I used it on two different glass surfaces, a leather couch, a futon cushion, even the carpet. The carpet was the only inconsistent one but that’s a given due the thickness and large surface changes as you move the mouse around. On glass it worked wonders and stayed incredibly smooth. This feat alone makes this mouse an incredible buy for any person looking to use the mouse on the go. 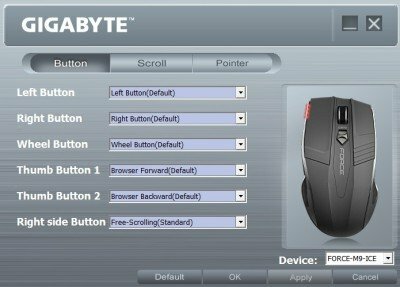 The software is not included with the mouse but you can get it directly on Gigabyte’s website. The software is nice and simple, allowing you to customize what each button does. I preferred to keep the mouse defaults (browser forward and back, middle wheel scroll, right button is free scroll). Here’s a snapshot (above) of what the SIM software looks like from Gigabyte. This mouse can be had for less than $50 at many online vendors and comes with a 2 year warranty. For the performance, versatility, and design, this is one of the best mouse options available at this price point. 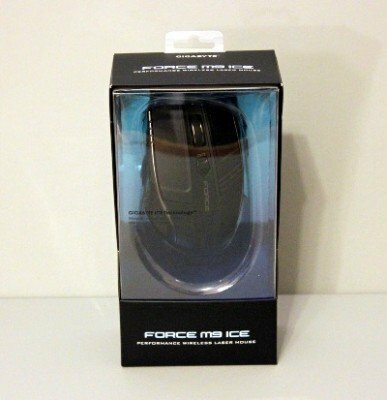 Packaging for the new Force M9 ICE from Gigabyte. Previous articleOktoberfest in September? Only in Fremont!